The annual Lake Travis Cleanup is a community-wide event that rids Lake Travis of tons of debris and waste. 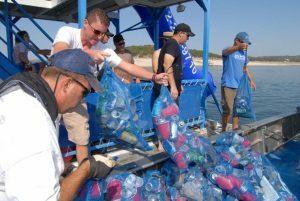 The Lake Travis Cleanup is the BIGGEST scuba diving and shoreline cleanup in Texas. Each year, local dive, shoreline, and party volunteers, gather to collect and average of 5 tons of trash from the bottom of Lake Travis and 11 Travis County Parks around the lake, while also helping to raise public awareness of the importance of Lake Travis and the Highland Lakes. The Lake Travis Cleanup is a great event for ALL ages! Rain or shine!